This Man Went To Bed With His iPhone Charging And Is “Lucky To Be Alive"
"It was worst alarm clock you could ever have in life." "This is how you die," Wiley Day remembers thinking before his eyesight faded and the pounding sound of his heartbeat filled his ears. He didn't know it then, but about 110 volts of electricity was jolting through his body — because of his cell phone. Like he does every night, the 32-year-old from Huntsville, Alabama, plugged his iPhone 7 into an extension cord on March 22 so he could scroll through his social media accounts before going to bed. While he was sleeping, his dog-tag necklace slipped between the exposed prongs of his charger and the extension cord. The heat and electric shock threw him to the floor. "My necklace became a conductor," Day explained. "It was worst alarm clock you could ever have in life." Moments later a numbness overtook his body and an immense pressure surrounded his neck as he shouted for his family members, who were sleeping across the house. He somehow managed to tug the necklace away from his skin as his niece ran into the room. "She said I kept yelling 'Jesus!'" Day said, recalling how he finally came to and realized he had nearly been electrocuted. 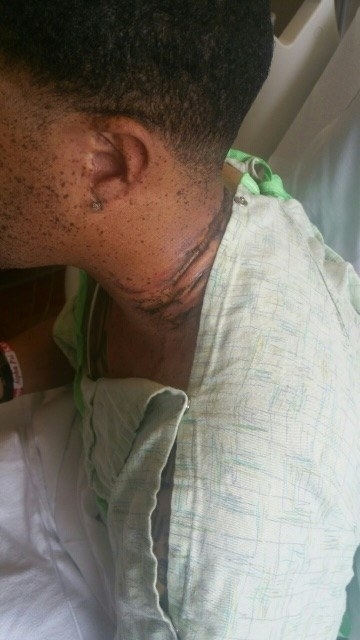 His sheets were smoking and pieces of flesh were missing from where the chain had seared into his neck. "I could taste burnt wire in my mouth," he recalled. "My hand still has the chain print on it." 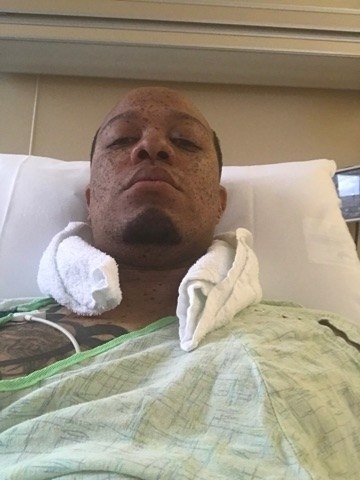 Day drove himself to the doctor, who immediately sent him to a local hospital. He was later transferred to the University of Alabama's Trauma Burn Intensive Care Unit in Birmingham, where he is still undergoing treatment. 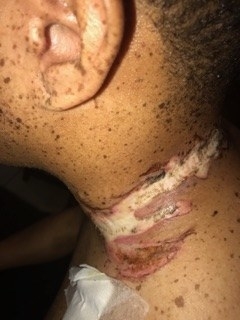 Day has second- and third-degree burns to his neck, chest, and hand. He has torn tissue in his left shoulder from the electricity leaving his body, he said. While UAB said they couldn't release the details of Day's injuries, they confirmed that he has a follow-up appointment on Tuesday. Dr. Benjamin Fail, who saw Day, told WAAY-TV that 100 volts of electricity can kill a person. He estimated that Day had been struck by about 110 volts. "He is lucky to be alive," Fail said. Apple declined to comment on the story, but directed BuzzFeed News to a page on its site that "recommends using only accessories that Apple has certified." Day said he never thought twice about purchasing a cheap extension cord from his local dollar store, since so many people use them to charge iPads, Kindles, and other devices while they read in bed, but the American Burn Association said extension cords cause about 4,700 residential fires each year, killing about 50 people and injuring 280 others annually. While his experience is rare, there have been multiple reports of burns and shocks from cell phones. 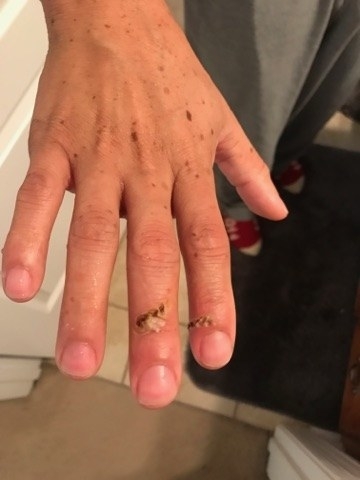 Last year, a teenage girl suffered second-degree burns from her LG phone. 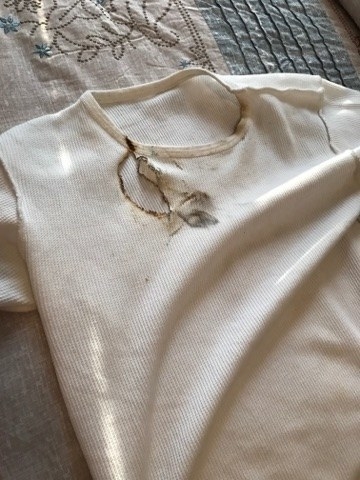 Jackie Fedro had been using her phone while it was plugged into a wall charger when she was shocked by an electric current that traveled from her phone to her necklace and singed her neck. 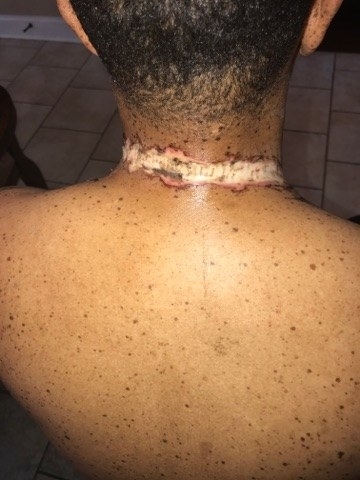 “She suffered painful second-degree burns and now will have a scar all the way around her neck,” Fedro's mom told BuzzFeed News, adding that her daughter was wearing a metal necklace at the time. A pregnant woman in Australia reportedly suffered second-degree burns in November after she fell asleep her with her iPhone 7 charging on her arm. Last August, a cyclist said his iPhone 6 caught fire and severely burned his leg after he fell off his bike. "I could see it melting through my shorts. I just remember looking at my leg and I had this black discharge all down my leg and this smell of phosphorus," he told the Sydney Morning Herald. A woman in China was allegedly killed by electrocution while using a faulty charger in 2013, according to CNET. Apple later posted a warning to its Chinese website urging consumers not to use third-party chargers. Day, a behavior specialist at a junior high school, is now speaking out about his experience to warn others about the danger of charging phones while sleeping. His ordeal was "a wake-up call" for his students, he said. "I know God saved me because my situation was one in a million," Day said. "But we are all so plugged in all the time I just can't help but think."